The Republic of Cyprus is a former British colony and a current member state of the European Union. It is located in the Mediterranean Sea bordered by Turkey (to the south), Syria (to the west) and Kastellorizo (a Greek Island to the east) with a population of 1.2 million people. Cyprus’s capital and financial hub is Nicosia. Its official languages are Greek and Turkish, although English is widely spoken due to the past British colonial rule. The Euro (EUR) became it’s official currency in the year, 2008 with its economy strongly dependent on the service sector (that is equivalent to 4/5 of the country’s GDP). Tourism is the main part of the country’s service sector, with about two (2) million visitors every year; then you have the financial and asset management sector. Cyprus is one of the most favourable European environment to start or set up a company or business, and so, it is referred to as the gateway of the European common market due to the favourable tax policies, economy and other foreign investment laws. It is chosen by many non-EU companies and serves as a portal of investment from the western world into Russia, the Middle east, Asia and South America. It is also a shipping hub with the Cypriot registered vessel, the fourth largest in the world and a large revenue provider. The Republic of Cyprus is an exporter of citrus fruits, cement, potatoes, clothing and pharmaceuticals. 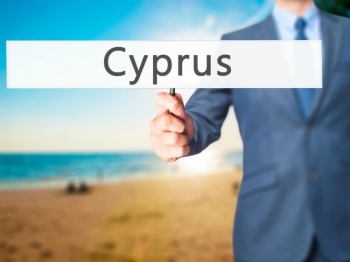 Many entrepreneurs/businessmen are eager to start up offshore company in Cyprus, but however, it is important to know that Cyprus is not an offshore zone in a traditional sense because companies in Cyprus must undergo the state registration process, submission of financial statements and hold annual shareholders' meetings. Cyprus has a far more stronger international reputation in comparison to other classic offshore jurisdictions. It is not on the "black list" of world offshore companies. Cyprus has signed agreements on double taxation with 60 countries. The financial statements in Cyprus are submitted in accordance with international standards. Cyprus has one of the lowest corporate tax rates in Europe. Many categories of expenses can be referred to prime cost. Extremely favourable conditions for the development of holding companies (there is no consolidation tax, and activity of a controlled foreign company is not regulated) with the main activity related to control of assets in other Cypriot companies. No tax on international/external dividends, on capital gains, on income from sales of securities. Simplicity of the registration procedure, and the low cost of maintaining the company. Possibility to trade with European companies (obtaining the VAT number). Convenience to operate with loans via Cyprus offshore company. If foreign experts of an offshore company in Cyprus work beyond the jurisdiction, they pay an income tax varying from 0% to 2%. Non-resident of Cyprus, who is the successor to the estate, is not subject to taxation. The possibility of using nominal service. Losses can be rolled over to subsequent tax periods until they are covered by income. Enhanced protection offered to its shareholders from a privacy point of view. The use of nominal service is allowed. If the following requirements are not met, there are certain restrictions placed on business activities which involves banking, insurance, financial services and much more without obtaining a special permit. A company name can be prepared in any language with the use of Roman or Greek alphabet, provided that the translation into Greek or English is submitted. At the same time, the name should be officially recognized as euphonic. It is prohibited to use names similar or analogous to existing ones. The names containing hint of illegality or connection with the patronage of royal families will not be registered. The companies with names containing such words as "trust", "bank", "insurance", "reinsurance" are subject to licensing. The name should end with the word “Limited (Ltd)”. Bank statement indicating the deposit of the share capital of the business. In accordance with the norms of the legal system of Cyprus, control over the activities of an enterprise is carried out via voting at the shareholders' meeting. At the same time, entitling documents retain the right to daily control over the board of directors. In order to steer clear from illegal actions of the director, the shareholders of a company are entitled to impose restrictions on his authority. In order to retain the status of an offshore company in Cyprus, the enterprise must conduct business activities, and shareholders’ meetings should take place beyond the jurisdiction. It is important for resident company that all decisions are made within the territory of Cyprus. Information about beneficial owners or shareholders is public and stored in the central bank of the Republic of Cyprus. If the identification of the owner of the company can lead to any negative consequences, it is necessary to preserve the anonymity of the data. This can be achieved by applying mechanism for the use of bearer shares or trust declaration. The Cyprus company pays the income tax of 12.5% (the rate was set in 2013). In Cyprus, there are no inheritance, real property, net wealth and municipal taxes. There is an immovable property transfer tax up to 8%. Value-added tax is 19%. The income from dividends and transactions with securities are not subject to taxation. Annual report containing information on shareholders, secretaries, directors. The first three types of reporting are submitted to the Tax Department of Cyprus, and the report in Greek to the Registration Chamber. Even in the absence of dynamic activities of the company and lack of accrued taxes, an offshore company in Cyprus must submit reports certified by the auditor. When planning to open a company in Cyprus. These are the various types of companies that can be opened in Cyprus. Limited Liability company. This could either be a private limited liability company or a public limited liability company. Partnership (General and limited partnership). A branch of a foreign company. It’s possible to open a branch or a foreign office in Cyprus. How long does it take to register a new company in Cyprus? Cyprus company registration could take up to 30 days. How much does it cost to register offshore in Cyprus? The cost of registering a company in Cyprus costs $1995 but from the second year, it will cost $1990. WHY INCORPORATE WITH LAW&TRUST INTERNATIONAL? Provision of a full range of legal, corporate, government, and business intelligence related services. Lawyers of Law & Trust provide free initial advice, as well as services for analyzing and developing a legal position on the issue you have raised. By contacting Law & Trust International you receive full advice and you may order a range of related services for incorporation of your business from the ground up or make comprehensive auditing and increase the effectiveness of an already existing one. Indication of BPA in the name Limited or Ltd. The tax on personal income Progressive from 0% to 35%. Special Defence Contribution tax applies to dividends (17%) and interest income (30%) instead of Personal Income tax. For rental income, a Special Defence Contribution tax of 2.25% is charged in addition to personal income tax. In Cyprus, Trademark Comprehensive Studies are for word marks only.